“You dined at Moti Mahal in Covent Garden in London,” Antonio said. “That’s my job, sir,” he said diffidently, and entered the room. The coincidence was not completely disjointed. Nira Alpina is the most recent of desirable destinations in the Nira Resorts repertoire, which include Nira Caledonia in Edinburgh and the paradisal Shanti Maurice in Mauritius, not to mention the aforementioned Indian eaterie in London. Alpina having opened just six weeks previously, Antonio was one of a handful of experienced staff brought in to bring the new venture up to speed. 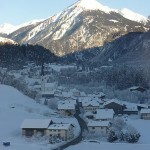 And it’s indicative of the relaxed, family atmosphere that Nira Alpina encourages. 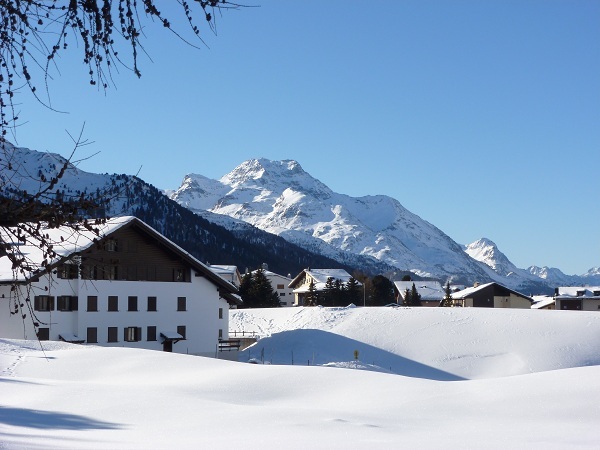 Nestled atop the village of Surlej, about 8km outside St Moritz, it’s to its credit that it hasn’t succumbed to the opulence of its more esteemed neighbour. Nira is not a new build but a recent conversion of a modern addition that must have lost its way previously. Its unassuming, even characterless, exterior may well have been its undoing. But in the hands of MPS Puri, Nira Resorts’ chief exec, the hotel is transformed. Thoughtful minimalism inside, in warm, earthy colours, and some catchy décor, from contemporary and often risque fashion photography on the walls to the cowhide-covered stools and ample leather armchairs in the bar, it’s as if the move to distance itself from the established grandeur of St Moritz is deliberate. I decided to put it to the test. No sooner had I arrived, and Antonio had fixed my espresso machine, than I was back out again. 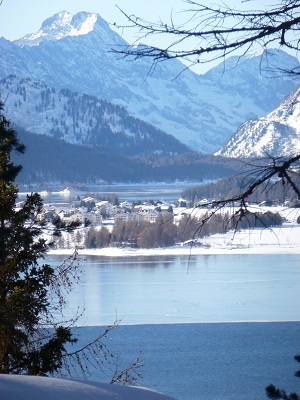 I’d heard so much about St Moritz and never been. 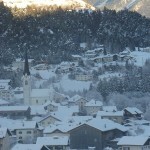 What was required was a quick tour, a bite to eat, get a feel for the place and then I could return to the sanctity of my hotel and prepare for a day’s skiing the following morning. Taking advantage of the hotel’s shuttle – a nice touch, indeed – I decided on the extreme and made for Badrutt’s Palace, St Moritz’s institution. 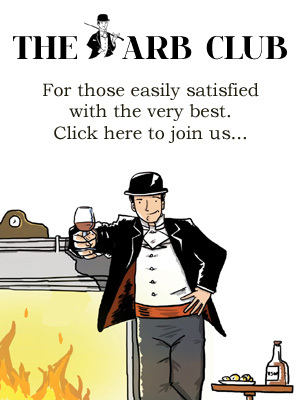 Sipping a negroni in the Renaissance bar, through the fug of cigar smoke, its neo-Gothic opulence radiated almost as much as the permatans of the clientelle. An altogether different crowd, indeed, and one I might have occasion to blend in with had I not just tasted the immediacy and calm of Nira’s ‘new world’ chic. As if serving as a metaphor between the two, I noticed the bartenders at Badrutt’s conversed mainly in Italian. Back at Nira, however, German was the chosen tongue. Italian opulence versus German sophistication. 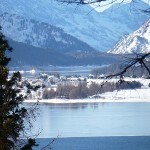 Two sides of the same coin that make up St Moritz. Before the negroni’s grip took hold, I paid up and parted company. Hunger was encroaching and so was my booking at La Baracca, another institution in the town, only of a completely different sort once more. Literally ‘The Barracks’, that’s precisely what they were. Sat in a carpark opposite the Kempinski hotel, it’s a tumbledown wooden shack inside as much as out, absolutely chaotic within with long benches bowing under diners sat shoulder-to-shoulder and a seemingly utter lack of any procedure. Somehow, though, amid wave after wave of 20-strong crowds bussing in and out, waitresses delivered hearty chalk-board specials and glass steins of beer, and a barreling boisterousness bristled within. I allowed myself to be carried along, somehow managing to be coralled by the owner, who looked as bewildered as I did, and enjoyed a delightfully rustic repast of warm beef carpaccio and pesto mash before being squeezed out by another surge and back into Nira’s shuttle arriving on cue and whisking me back to the space and sanctity of the fifth floor bar and a medicinal scotch in one of those cosy retro leather armchairs. The idea of ‘Ski In, Ski Out’ for a hotel is not something that can be underestimated. Nira Alpina sits, literally, at the end of the run from the Corvatsch cable car. If you pick up enough speed coming off the piste, running the gauntlet through fearless toddlers on the nursery slope, you can, if you’re on the ground floor and you have enough momentum, ski straight into your room. I’m a particularly clumsy skier; all poles, tangled straps and crossed skis. Having only ever been twice before, of all the places I wouldn’t have thought I’d fit in, St Moritz must have topped the list. It always struck me as a sort of apogee of skiing prowess. This was confirmed when I opened the map of pistes to see a network of red runs and I nearly resigned myself to a day on the nursery slope. Not so, however. A reassuring conversation with the concierge, having shuttled me down to the hire shop (see how good they are? ), my fears abated. She, too, wasn’t that proficient, she told me. Right. In comparison to whom? Franz Klammer? The reds weren’t hard, she said. And they weren’t. There is a certain inevitability to skiing. A chairlift really only goes in one direction, and mountainsides, similarly, only let you go one way. What began tentatively on the one broad, undulating blue at the Corvatsch mittel section soon evolved into more confident coursing down the Chastelets run, so that by the section through the pine forest into Surlej I was humming the theme from On Her Majesty’s Secret Service. It was coming back to me. What had grown as confidence, however, soon morphed into the monster that is cockiness, although nothing a few headfirst out-of-control crashes into snowdrifts couldn’t temper. It was reassuring to know I was less Franz Klammer, more Frank Spencer. Having soon realised my range and ability, it allowed for a thoroughly enjoyable afternoon. And there is one thing to Surlej’s credit, it’s not overcrowded. By the close of play I must have been one of the last people on the pistes. In the amber sunlight, there was a wonderful sense of serenity, taking in the views as one of the last on the chairlift and the only sound on the final run home being the satisfying crunching ‘shuss’ of the skis gliding over the snow. I coursed effortlessly through the pines, the momentum carrying me across the nursery slope, weaving past the last of the toddlers, and a quick parallel turn pulling up to the hotel. Well, I would have done. Instead, I came off the piste, swerving down-run to avoid said toddler, missing the hotel and upset balance now tipping me from left foot to right and ending up in a heap at the bottom of the nursery slope. Dinner that evening in Stars, the restaurant at the top of the hotel that overlooks Lake Silvaplana, with Stephanie, the Marketing Manager, and Fraser, a ski tour operator from London, and his wife, was a delightful affair. Stephanie extolled the virtues of their ‘sharing’ menu that featured some classics from Moti Mahal, such as wasabi lobster and chili prawns, as well as a variety of hearty wintry fare, including Swiss spring chicken, Iberico pork and aubergine ‘steak’ and a fabulous mushroom and truffle risotto. All delivered with Antonio’s characteristic verve. If you’ll pardon the pun, it goes without saying that Swiss trains run like clockwork. Indeed, there’s a saying that if a Swiss train is late your watch is wrong. Leaving Zurich station’s vast Gothic concourse, once out through the town, the tracks run the length of the picturesque Lake Zurich on your left and, as you get closer to the mountains, that’s when the scenery gets really interesting. 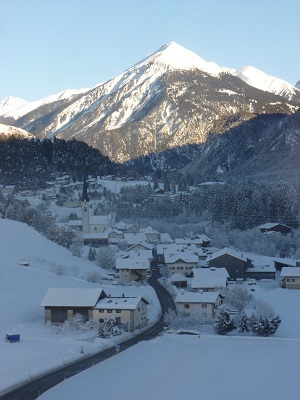 Changing on to the ‘Glacier Express’ at Chur, with the benefit of its ‘panorama’ carriages, so attractive is the ride that the entire 122km line from Thusis to Tirano has been designated a UNESCO World Heritage site, and is only the third railway line in the world to be given the accolade. And you can see why. 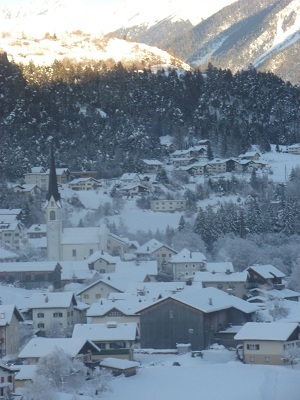 Opting for Belle Epoque elegance in the dining car, we wended and weaved our way through ghostly pines, their boughs hanging weary with snow, and archetypal idyllic villages, such as Filisur, where wooden snow-topped chalets hugged steep church spires. 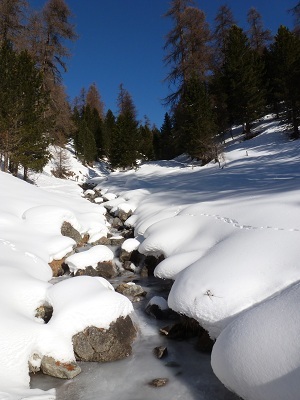 As we crossed the Landwasser viaduct, one of the many bridges (196 in total) on the line, in the valley below untouched crystalline snow sparkeled in the afternoon sun as it sighed its last and retired behind the peaks. Nearing our destination, we entered the Albula tunnel, a four-mile network built in 1903 that loops and spirals inside the mountains in order to assist with the sharp 460-metre ascent required before the run to St Moritz. I’m specific with my facts here not by diligent research but because these hadn’t passed the Swiss by either. During the journey, every so often the train’s tannoy gave a running commentary of that which we were passing through. It was enriching, to say that least, and significantly, it set the scene for what was to follow. 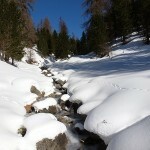 Nira Alpina defines relaxation. It could simply be exactly what was required after a day tensing every muscle in my being on the slopes but the massage I enjoyed that evening in the spa practically melted me into submission. As if its alpine setting wasn’t enough, with each of its 70 rooms having views over the Engadine valley below, its hospitality is effortless, almost laissez-faire. Certainly, it has five star flourishes that remind you that you’re somewhere special but still theirs is a homely atmosphere. Within minutes of arriving there’s a comforting feeling that you’re somewhere familiar. To the extent that you might already know the staff. Larry flew SwissAir from the effortless, congestion-less and stress-free London City Airport. 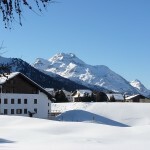 Flights to Zurich begin at £127 return. And leave on time. 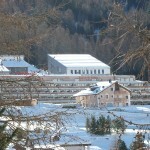 Find more information on rail travel through Switzerland at www.swisspasses.com. 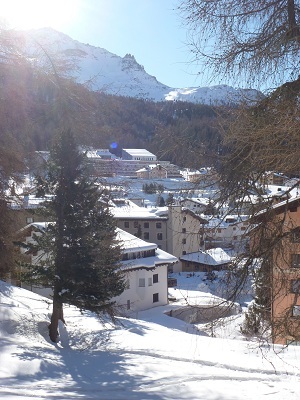 Nira Alpina opens for its 2012/13 winter season on 29 November and will be offering all guests staying at the hotel a free ski pass. 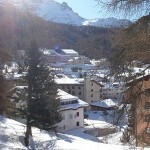 As well as this the hotel is offering a series of new packages from ski & yoga to snowkite lessons. For more information visit the Website. Nira Alpina, Via dal Corvatsch 76, CH-7513 Silvaplana, Switzerland. Tel.+41 (0) 81 838 69 69.